Still Water Co-Directors Joline Blais and Jon Ippolito are founding members of the Ecovillage, along with 20 other families dedicated to this self-developed and self-financed neighborhood. Its home design won the 2011 LEED Project of the Year. Apart from net-zero energy homes, the project features a Book of Commons ensuring that all residents share in a large Common House, food growing in their backyard, and governance by consensus. As a US senator, Mitchell gained renown as an envoy in the Arab-Israeli peace process, and won the Presidential Medal of Freedom for his role in securing peace in Northern Ireland. The groundbreaking was covered by numerous television, newspaper, and radio outlets. “This project is unique in so many respects,” Mitchell said. efficiency, its environmental concern and its “walkable” design. Cohousing members aren’t among them. 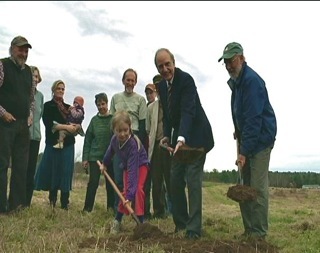 An innovative and long-planned co-housing development in Maine has finally broken ground. The Belfast Cohousing and Ecovillage will consist of 36 one-to-three bedroom homes, built to meet the highest standard for energy efficiency in the world. 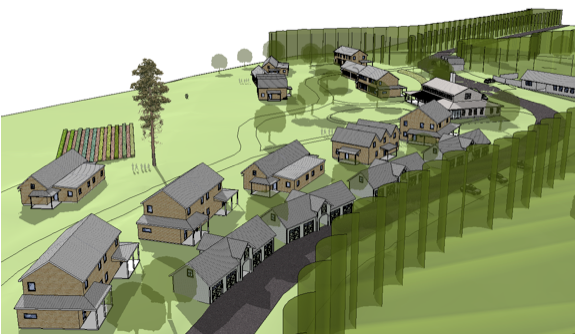 Houses will be clustered together on the roughly 41-acre site of a former dairy farm, connected by walking paths to promote community cohesion. Residents will work together to run their affairs. That the project actually has cement in the ground is no small achievement, at a time when the housing market nationwide remains dismal, and the appetite for new multi-home developments is limited. Jeffrey Mabee, who will be moving into the community. Former Senator George Mitchell commends the sustainability of the community. “I think it takes a project like this to create an awareness that by acting together we can do something,” said Mitchell.